Imagine a 600-page book that could not only show you the history of the classic Star Wars trilogy like never before, but could also transport you to Tunisia, or Pinewood Studios, as a young filmmaker named George Lucas forged his legacy. Picture yourself at Skywalker Ranch, or in the halls of Lucasfilm in San Francisco, with unrestricted access to more than four decades’ worth of Star Wars archives. What might it be like to know and see all that’s gone into the making of these beloved movies, with Lucas himself as your personal guide? 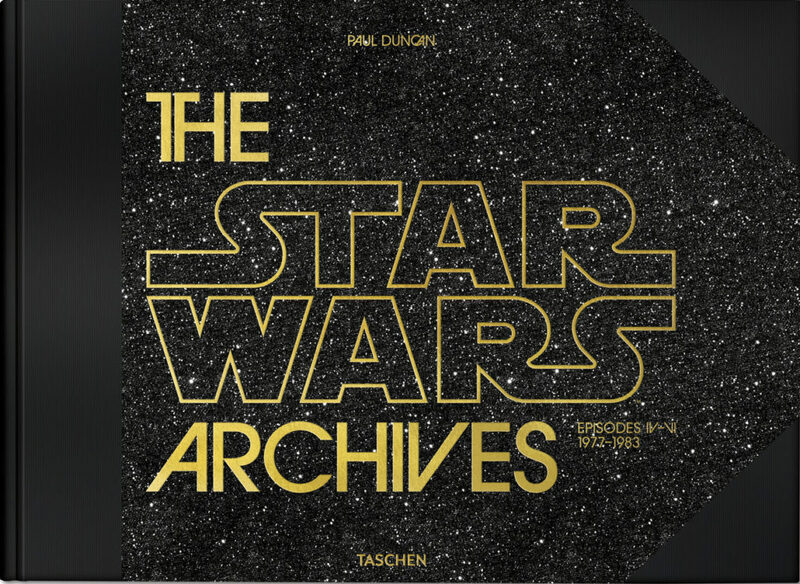 This, it seems, was not too much to ask for film historian Paul Duncan, author of the new XXL-sized chronicle from Taschen Books: The Star Wars Archives. This weighty tome is a film enthusiast’s dream. After getting our hands on a copy, StarWars.com rang up the author to find out just how much work goes into a project like this — and what it’s like to spend three days in conversation with George Lucas. 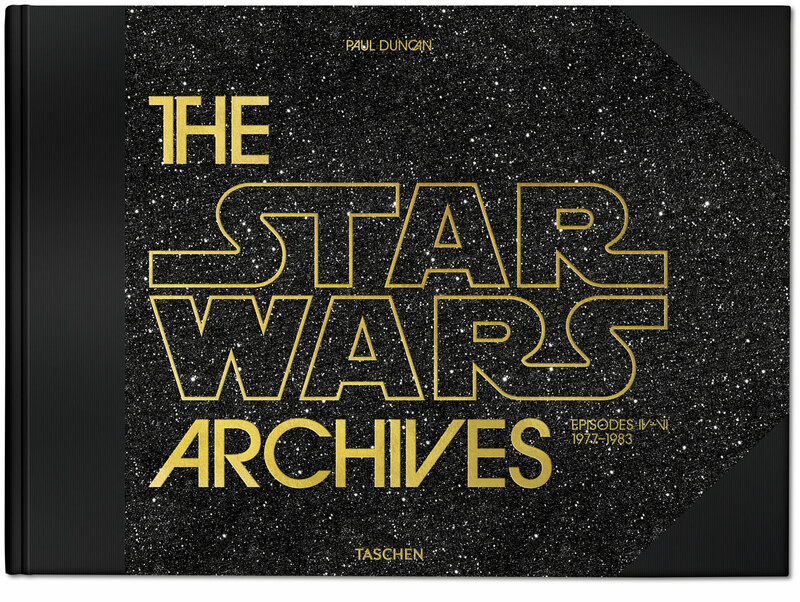 StarWars.com: You’ve done a ton of books for Taschen, which of course are these great volumes for people who love film. So what excited you about getting to do one on Star Wars? Paul Duncan: I was the first in the queue when Star Wars came out in Nuneaton, in the UK, on January the 29th, in the very first screening. I turned up four hours early. It was cold; it was wet; it was windy. Because I had seen the pictures in America, and I thought, This is gonna be enormous. It’s gonna be bigger than Ben-Hur. It’s gonna be bigger than Gone with the Wind. I’ve got to be there. And of course I was the only one there. So this was the first film I’d actually seen on my own. I waited in the wind and the rain, and I went in, sat down, and bang — I was in. I was hooked. And then I wondered, Well, how on earth did they do that? This is just amazing. Then when I was 15, in 1980, a friend of mine was really into Doctor Who, and he showed me some Doctor Who fanzines, and we both said, almost at the time: “Why don’t we do our own magazine?” And that’s when I started writing, and starting to do fanzines. And the very first thing I actually wrote was a preview: a collation of all the information I’d got together on The Empire Strikes Back. So it’s sort of like — how many years later is it now? Too long. Paul Duncan: Yeah. So, 38 years later, I’m actually doing the sequel to that, in this really big, ginormous book. I’ve been waiting for this moment, even though I didn’t know it. But that really started me off. That interest and enthusiasm and desire for knowledge is what’s brought me to the now. That’s all shaped my life. 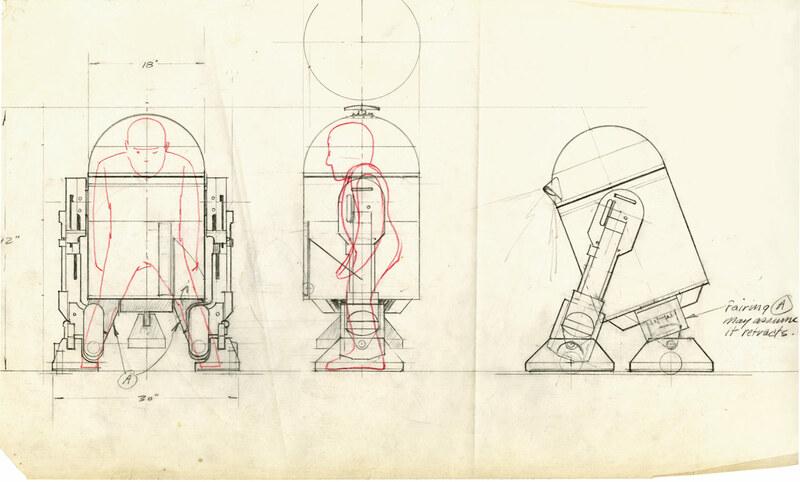 Star Wars (1977): R2-D2 presented a challenge to his designers, as well as to actor Kenny Baker, performing inside him. The little robot did not walk but stood on two feet and rolled forward on three legs. Credit: Courtesy TASCHEN/TM & © 2018 LFL. All Rights Reserved. 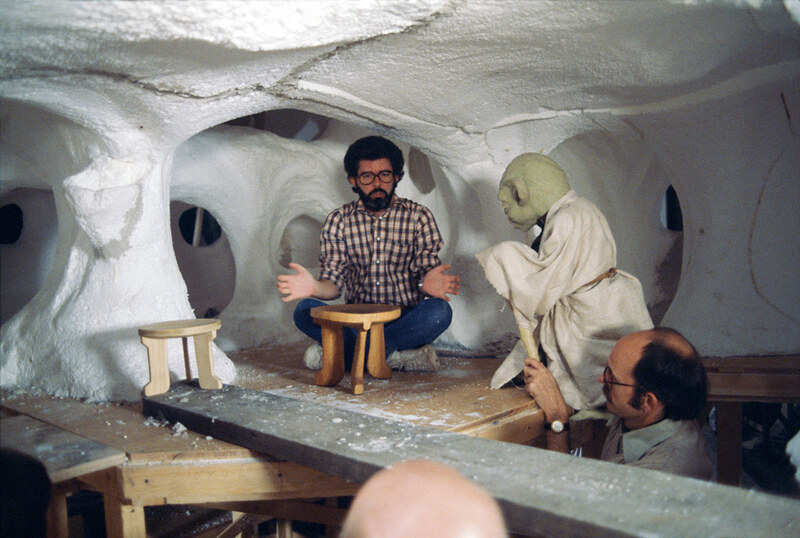 The Empire Strikes Back (1980): Frank Oz (right) rehearsing as Yoda, with George Lucas standing in for Luke Skywalker. Credit: Courtesy TASCHEN/TM & © 2018 LFL. All Rights Reserved. 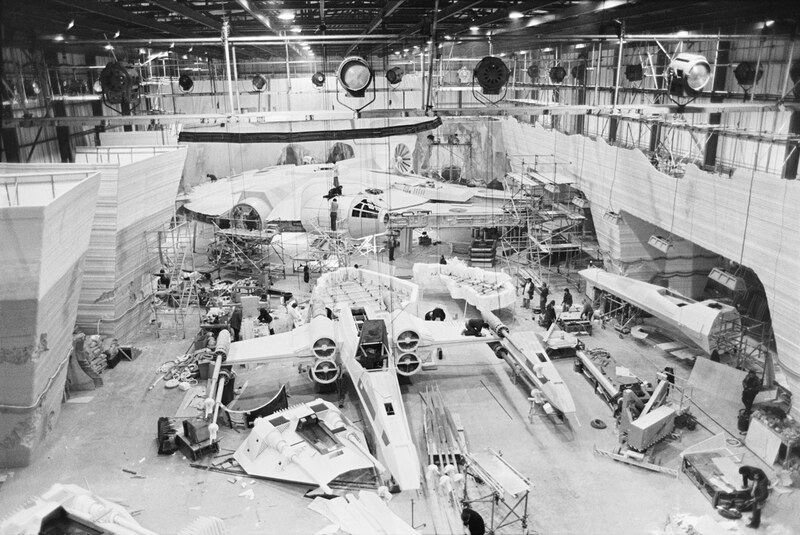 The Empire Strikes Back (1980): Construction of the main hangar of the rebel base on Hoth. In addition to X-wing fighters and snowspeeders there is a complete Millennium Falcon. Credit: Courtesy TASCHEN/TM & © 2018 LFL. All Rights Reserved. StarWars.com: The whole sort of backbone of this book is an interview with George Lucas. What was that like? Paul Duncan: It’s an oral history. What I’ve done for the past few years, on the Archives books that I’ve been doing — I’ve done Ingmar Bergman, James Bond, Pedro Almodóvar, Charlie Chaplin, and obviously Star Wars — what I’m interested in is the oral history. I’m interested in the people who were actually there, who actually did the work, who know what they’re talking about. And what I’m trying to do is to represent it in the present tense, because most books are written in the past tense. I wanted to present the book in a way that you felt that it was unfolding. For the people who were making the movies, they had no idea what was gonna happen; there was no guarantee that anything would work, or be successful, or how they envisioned it. So that’s what I want to do — to bring us back to that. We’re looking over the shoulder of George Lucas, and there are no outside opinions; it’s purely historical fact that goes into it. There’s no second-guessing or anything like that. When I was putting together the book, I had no idea what book I was going to make. And after about a year of research — of going through all the different documents, going through all the different artwork, going through all the different photography, I realized that the one thing I wanted to know was the why. The who, what, where, when you can often find from all these documents, and the artwork, and the photography, et cetera. But I wanted to know the why, and really the only person who could provide me with that was George Lucas. And that’s really when the focus of the book narrowed down to George. I wanted to know what George’s experience was in making the movies. I wanted to be like a little little bird on his shoulder, a little porg on his shoulder, watching him and listening to him as he’s making the movies. So that was my ideal, and once I’d realized that, it then became a matter of focusing the text and the images and how I present the book in order to show that story. StarWars.com: Sort of like a 600-page director’s commentary. But there was another thread that was going through it, which was that he had been very pleasantly surprised by the connection that he’d made with young people on American Graffiti. Part of the reason why I cover THX 1138 and American Graffiti in the book is that I wanted to show George’s development as a filmmaker, but also as a thinker, and to show how his experiences on those movies influenced his philosophy on Star Wars. For example, on American Graffiti, he was really, really touched by the way that people had responded. They understood that whole cruising scene, and the whole idea of rites of passage and changes in teenagers’ lives. It felt real to people. And THX 1138, even though it’d been very well critically received, didn’t make hardly any money whatsoever. He was trying to work out, Why was this? And THX is critical and sarcastic; it’s black humor; it’s from his mind. It’s an intellectual idea. Whereas American Graffiti was something from his heart and his life. And he realized that there was this idea of him connecting to people that he wanted to continue for his next project, on Star Wars. There was a certain point in the development of Star Wars where he had the opportunity of choosing between Apocalypse Now, which he’d developed with John Milius, and Star Wars. And Apocalypse Now was, as he envisaged it, more of a dark comedy. More of an indie sort of found-footage-type movie — closer to, say, the original MASH by [Robert] Altman or Catch-22. Something in that vein. Whereas Star Wars was much more positive; it was aimed at 12 year olds, and it also connected far more closely to his outside interests. When he went to college, he discovered that you could actually study anthropology. George had collected — as well as having shelves full of comics in his shed when he was a kid — tons and tons of National Geographics, which he enjoyed and absorbed and devoured. And in college, he discovered anthropology, and the idea that all these different aspects of religion and mythology all coalesce into one universal myth, as per Joseph Campbell, as with [James George] Frazer’s Golden Bough, which he also read. And the Star Wars project really came out of that interest in anthropology, and the idea of this connection to young people, and him trying to make something that showed the rules of life — which young people could absorb through this new mythology he was making into Star Wars. Return of the Jedi (1983): Darth Vader’s (David Prowse) choke hold. 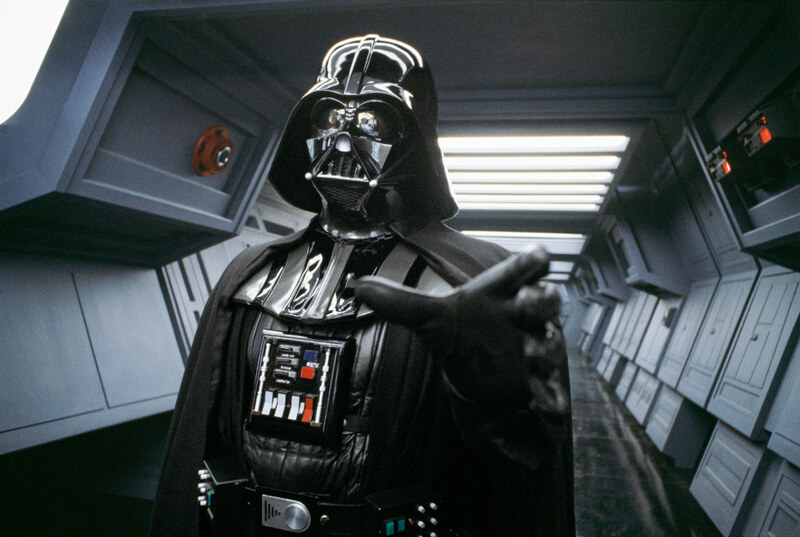 David Prowse: “I don’t have to get into the part at all. As soon as they start enclosing me in the mask, I begin to feel more evil with every plate they put on.” Credit: Courtesy TASCHEN/TM & © 2018 LFL. All Rights Reserved. Return of the Jedi (1983): Carrie Fisher, clowning as she models her Endor costume, which was designed by Rodis-Jamero in collaboration with Aggie Guerard Rodgers. Credit: Courtesy TASCHEN/TM & © 2018 LFL. All Rights Reserved. StarWars.com: The book explores Lucas’s obsession with documentary-style filmmaking. At one point, he says he has a preference for editing. He says he doesn’t really enjoy writing or directing, but he loves to edit. Do those things go hand in hand a little bit? Paul Duncan: I think that he really undersells himself, because he is very understated. And because he repeats it, people tend to believe it’s true. But it’s not. You know, he is actually a fantastic writer. He’s a fantastic plotter. And one of the things I was most surprised about, when I was going through the original treatments and the screenplays, et cetera, is that virtually everything is George. I don’t want to underplay or dismiss other people who have written on the movies, but I was really, really surprised at how much of it was George. Great lines in there. StarWars.com: The thing that struck me in the beginning is how much you go into detail about his film-school years, his interests, and the earlier, more workmanlike projects he did with other people. You sort of take your time getting to Star Wars, and so it does put you in that thematic headspace. It works. Paul Duncan: It’s a continuity. I’m trying to show that his work is one thing — it’s him. I’m trying to show what his influences are, and that this is one aspect of his life. But we’re also more than just that one thing. We are all multitudes; we’re all legion. And the fact that we express ourselves in one particular way doesn’t mean that’s all there is. There’s more to George, and he’s a really nice, cool guy. StarWars.com: Did you interview him in person in California, then? Paul Duncan: Yeah, yeah. I was at the Ranch. So I was basically researching at the Presidio for all the photography, looking through all the originals, and then I’d be at the Ranch researching all the original artwork and going through those. And then I’d go through all the production documents, as well, that are at the Ranch. And the clippings at the Lucas Research Library. After about a year, I realized what the shape of the book was going to be — that, really, it needed to be about George — and that’s when I asked to interview him. So on three separate days, not consecutively, I went and I interviewed him in his office at the Ranch. Which was pretty amazing. But the thing that came across was that George is so into Star Wars. You know, he started talking to me about parsecs, right? And I said, “George, where do you come up with all this stuff?” And he says, “Well, I’ve got nothing better to do.” I was amazed, and I felt that I’d hardly scratched the surface after talking to him. He’s gone into so much detail about every aspect of the background, and the history, and different characters and vehicles and devices. And we’re just seeing the surface of them in the movies. And I think this is also part of what gives his worldbuilding a sense of authenticity — that he spent so much time with these characters and worlds. It’s allowed him to live in them for very, very long periods of time, and to expand out. When you’re writing something, you do a lot more than what’s visible in the final work. He’s built up, in his mind, this tremendous, very diverse, and very detailed Star Wars universe. And George loves this. He loves Star Wars; he loves his creation. And so he should. StarWars.com: You unearthed some stuff that, in past books, we would not have expected to see. You have appendices on the Holiday Special, the made-for-TV films, the Droids and Ewoks cartoons. We’re sort of allowed to talk about those again. Was that surprising to you? Paul Duncan: When I do a project, I always ask for what I want and hope I get it. And with the Holiday Special, I understood the history of it. But the thing that interested me about the Holiday Special — and I asked George about it — was that I couldn’t understand how it had come about, and I couldn’t understand why George didn’t have more control over it. And the way George responded was basically that he’d learned his lesson on that. The fact that he didn’t take control of it, the fact that he didn’t look after it and steer it in the way that it should have been, was a lesson he learned. So purely for that statement, to show how it developed and how it slipped out of his hands, I thought that it was important for the book. Because it showed George learning. You’ve got to remember that it’s one thing being a writer or a cinematographer or an editor. But to then become a director, and then become a producer, the responsibilities and skill sets are very different for each of these jobs. There was a lot of pressure on George to do Empire, and I think perhaps he had one ball too many to juggle. And I think that was the lesson that he learned on the Holiday Special. With the others — on the Ewoks movies, and the animation on Ewoks and Droids — there was a lot of material. I was surprised at how much material there was, both in terms of production material and visual material. And there’s some tremendous stuff. In the end, I was a bit disappointed that I had so few pages. The Star Wars Archives is available now.